Well it was either this or chocolate chip cookie dough. This Caramel Corn was actually faster... and healthier. You know those moments when you're just overcome with a craving? Well I was craving sweet (and maybe with a bit of salty) and God knows I didn't have the patience to wait the hour or so that it takes to make regular caramel corn!! I wasn't gifting this to anyone, I wasn't going to wrap it up and eat it two weeks from now, I wanted it right then and there. Alas, I guess that's what the Christmas spirit does to you...it just makes you a little crazy, right? 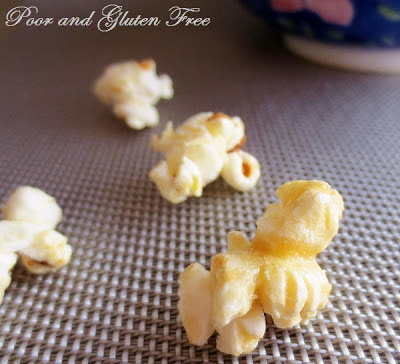 So I whipped up this caramel popcorn in about 5 minutes and ate it with a spoon! Now most of you know that I don't do sugar. The only sugar we keep in our apartment is the organic brown sugar hubby likes in his oatmeal. But I was working in a moment of madness and knew that butter and sugar = caramel. That said, I suspect you could try this using honey or maple syrup instead of sugar, it just might not solidify as well as the sugar, and may be stickier. I will probably do this in the future, when I am in a more leisurely state of mind. So I can't really say this is a "healthy" snack, but it's better than regular caramel corn because it only has a teeny amount of brown sugar, rather than baked caramel corn that has a ton of sugar, and especially compared to store-bought caramel corn made with corn syrup! 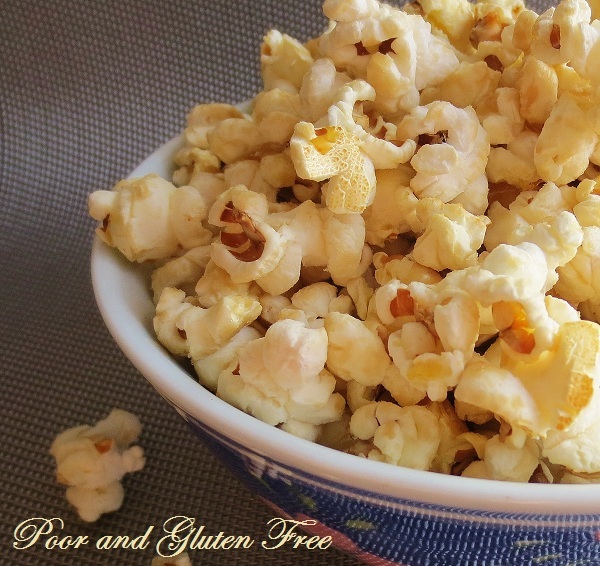 I don't know how well this popcorn would hold up long term if you were give it as a gift, because it doesn't go through that whole process of being smothered in sugar and baked, but it's a great quick fix for a movie snack or a late night craving. I had enough to last me in a sealed bowl for about 3 days, and it still tasted fine. This makes one extra large bowl of popcorn, about the equivalent of a bag of microwave popcorn. 1. To make the Cheater's Caramel, mix together the butter and the brown sugar in a microwave safe bowl. Microwave for about 35 seconds, until the butter melts, and stir rapidly to dissolve the brown sugar. Add the vanilla and mix in. Prepare to work fast on this! Make sure you read these directions carefully, especially if you've never made popcorn the old fashioned way before. 3. In a large pot, heat the oil over high heat on an oven burner. Toss in one or two kernels to check the temperature. Shake the pot periodically, until the kernels pop. If they don't pop, but burn instead, the heat is not high enough. Get rid of the burnt kernels and turn up the heat. When it's hot enough, pour the rest of the popcorn kernels into the pot. 4. Put the lid on the pot, put on your oven mitts, and shake the pot, holding it up slightly above the burner. Periodically you can touch the pot onto the burner to keep the heat high. Keep shaking and heating the pot until the popping slows to 3-4 seconds between pops. 5. Remove from the burner, turn the heat off, dump the Cheater's Caramel mix onto the popcorn, put the lid and your mitts back on, hold the pot over the still hot burner and shake like mad to distribute the "caramel." 6. Sprinkle with salt and shake again. Dump into a large bowl and eat with a spoon to keep your fingers from getting sticky! Lol, EMC, the dangerous part of this one is that you CAN make it on demand ;p That said, it's definitely not the most unhealthy movie snack in the world. Thanks so much for stopping by! Thanks for stopping by, I hope you enjoy it, Megan! We love caramel popcorn and I love that it is dairy free too. I found you on the GF Friday blog hop. I haven't tried it so I'm not sure - I know that the combo of butter and sugar makes a harder caramel texture, but I don't know about coconut oil and sugar (or honey or another sweetener). It would probably taste wonderful, but I suspect it might be very sticky and a bit oily. You could always try heating a small batch of coconut oil and your sweetener in a bowl, then letting it cool and seeing what consistency you get, then decide from there. Let me know if you try it, I'm curious!